IP TelCom Review 2019: Is IP TelCom a Good Hosting? IP TelCom is a Belarusian based website hosting provider. It offers a streamlined selection of hosting plans, designed for a Belarus customer base. 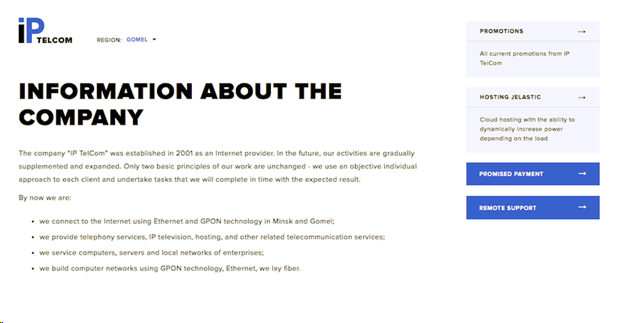 IP TelCom was founded in 2001. It has offices in Minsk and Gomel, Belarus. The simple, clean website is available in Belarusian. IP TelCom offers a simple selection of plans: shared hosting and virtual dedicated servers, and also works with MyCloud who provides cloud hosting. The shared hosting packages come with GNU Linux operating system, support for various PHP versions, although it’s not clear which ones, automatic backups, and optional separate IPv4 and IPv6 addresses. It is not clear what the uptime is, either, unfortunately. IP TelCom offers three packages of shared hosting, Hosting 1, 5, and 10, as well as three packages of Secure (dedicated) Hosting, called Secure Hosting 1, 2, and 3. The shared packages range from the basic package with 1GB of disk space, one domain, and one database, to 10GB of disk space, ten domains, and ten databases. All plans come with “unlimited” traffic. The prices are very, very affordable, regardless of which plan you need. Most everyday website owners will find the resource quotas in Hosting 1 sufficient, however, even the highest Secured Hosting plan is still extremely cheap. All plans are exclusive of 25% VAT, domain registration, and SSL certificates, and there is a small setup fee. While usually this would be bad news, the prices are so cheap, I can’t complain. My slight issue is that payment cannot be made online, so the setup process is slightly more complex than most shared hosting companies. The support available depends on whether you are located in Minsk or Gome. For Minsk, you can get sales (non technical) support by telephone and email, Monday through Friday from 9:00 a.m. to 6:00 p.m., with technical support being available Monday to Friday from 9:00 a.m. to 10:00 p.m. and Saturday to Sunday from 9:00 a.m. to 9:00 p.m. Gomel support is a little more limited, available from Monday to Friday from 9:00 a.m. to 8:00 p.m. and Saturday from 9.:00 a.m. to 4:00 p.m. There is also have remote support available with TeamViewer and a client only section of the website, so it’s unclear if there us a help center which is behind the login pages. IP TelCom is an internet service provider focused on serving two regions in Belarus. Since 2001 it has grown from providing only internet services to many communications and information technology services. Check out IP TelCom’s web hosting options today! Wondering how IP TelCom stacks up against other Web Hosting companies? Enter any other Web Hosting company and we will give you a side-by-side comparison.